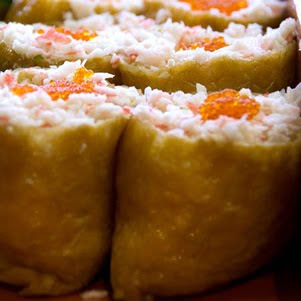 Whenever I get food cravings it is usually for Asian food of some kind – more often than not it is for Japanese food. There is something about Japanese food that really appeals to me – the light delicate flavours, the relatively healthy use of ingredients (unless of course I am tucking into tempura!) and the clean, freshness of its preparation. Working in the city for so many years meant that more often than not a couple of nori rolls were my standard lunch. Then one day I spied these yummy looking pouches of fried tofu, filled with sushi rice and topped with crab meat or seaweed. Yep – I’ll try one of those thanks. Well – from that moment on I was completely hooked. The sweetness of the rice is a complete delight and well what can I say they are just totally delicious! I was in LOVE. 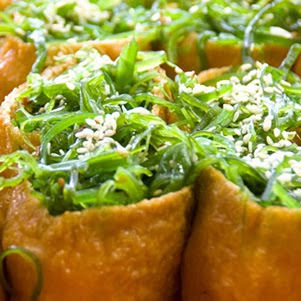 Apparently Inari-zushi (stuffed sushi) is named after the Shinto god Inari, whose messenger, the fox, is believed to have a fondness for fried tofu. Lucky for me the fox is happy to share. I would have to agree Japanese food is delicious, There is a great Japanese restaurant in Richmond where you can cook your own upstairs while enjoying a Saki or 2!! !